The sudden decision to close the line from Kasina Wielka to Nowy Sacz to passenger traffic has taken several groups by surprise, not least Towarzystwo Przyjaciół Wolsztyńskiej Parowozowni (TPWP) who have a planned photo charter for 10 October. The line from Chabowka to Nowy Sacz, part of the Kolej Transwersalna had recently been subject to renewed activity, due to the Małopolskie Szlaki Turystyki Kolejowej (Malopolska Railway Tourism), organised by the Nowy Sacz Railway Enthusiasts Society. The society had recently received funding of 200,000 zl, (about £35,000) from the Malopolska regional government to run a series of charters along the line. They too, have had to change plans, for trains later this month, and into October and November. The decision, taken on safety grounds, was made by PLK, the business which runs Polish rail tracks. With limited (if no) maintenance being undertaken on sections of the line, the permanent way is in poor condition. The remaining part of the line, from Chabowka to Kasina Wielka remains open. The line has been threatened with closure before however had a last minute reprieve. With no scheduled freight service over the line, the closure is effectively a total closure over the scenic and heavily graded section between Kasina Wielka and Nowy Sacz. More of Robert Dylewski’s photos of this year’s Chabowka Gala can be seen on the Fundacja Era Parowozow website. The board of PKP Cargo have decided to go ahead with this year’s Parowozjazda, the Chabowka Steam Gala, which will take place on Saturday 5 and Sunday 6 September. This year’s Parowozjazda will – unlike previous galas – will take place entirely within the confines of of the Chabowka Skansen. 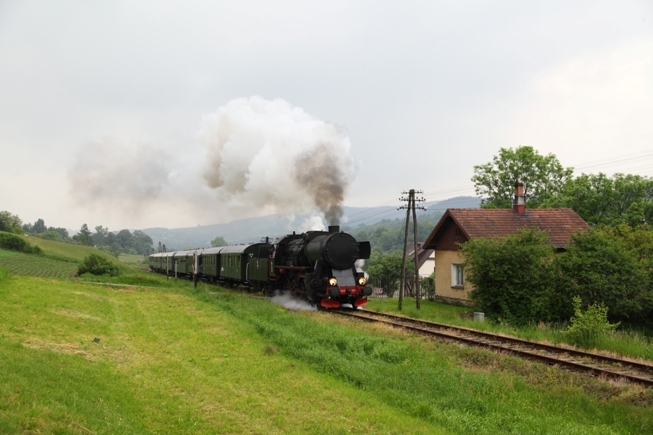 On Saturday 5 September, special vintage trains will bring guests from Krakow Glowny, Zakopany and Mszana Dolna. It is likely that the first of these will be operated by a vintage electric locomotive and that the others will be steam-hauled. The train from Mszana Dolna will be the only special train operating on the Chabowka – Nowy Sacz line this year. The following locomotives are planned to be in steam: Ol12-7, Ty2-911, Ty2-953, TKt48-191, TKh49-1, Pt47-65 (Wolsztyn), Tr5-65 (Wolsztyn). This year, as well as the usual PKP steam gala attractions, a welcome addition will be conducted tours round the workshop and the possibility of seeing some of the equipment in action. Our friends in the British-Polish Railway and Industrial Heritage Partnership are organising a study visit to Poland for a ‘long weekend’ from 3 to 7 September to include the Chabowka Steam Gala, and the Bytom, Przeworsk and Bieszczady Railways. Most of the travel in Poland will by train. If you are interested in going let us know. We really should have written about the Chabowka-Nowy Sacz line before, as PKP Cargo have been using it this summer to run ‘regular’ steam trains. Usually hauled by a Ty2, the trains run from Chabowka to Dobra-Kolo-Limanowej and back. Two trains ran in June, two in July and five are running in August. Chabowka publish an English language timetable giving details of all of this year’s regular steam workings. Fortunately, our memory was jogged by reading about a journey on the line on W-wa Jeziorki blog. The place we stayed, an agroturystyka in a large village/small town called Dobra (between Nowy Sacz and Wadowice) was run by really lovely people, great cooking, flexibility at meal times and – at 50 zlotys (around 11 quid) for bed, breakfast, lunch and supper (40 zlotys for children) – a snip. Eddie noted that there was a railway station in Dobra, and given that the weather on Saturday morning was dismal, we thought it would be a good idea to stroll down there to take a look. The walk through the village (small town really) was long; we got lost, had to ask the way, neared the station (up the hill) and as we neared it… the sound of a steam whistle! Eddie and I simultaneously broke into a jog (I’m delighted to say that this 50 year-old burdened with camera bag can still out-run his 12 year-old son up a steep hill). The whistling continued. Would we catch the train? We made it up to the station – and there it was – a 2-10-0 Kriegslok steam locomotive, manoeuvring around a rake of five two-axle coaches. To our delight, it transpired that we were in good time for a steam train excursion from Dobra to Chabowka railway museum. A quick glance at the timetable showed that we were up for a three-hour steam-hauled trip with an hour’s museum visit all for the equivalent of ten quid! The line is spectacular (by Polish standards) for its mountain scenery. It was here that scenes from Schindler’s List were shot – both engine and coaches are 100% authentic for the period. Clicking on the photo on the top of this post will take you straight to the original article with all five of Michael Dembinski’s superb photographs accompanied by some well-researched captions. The extract is just a taster. I enjoyed reading this account of his steam trip, but we feel that his last paragraph (too many beers? too late at night?) lacks the accuracy and fair play that I have grown accustomed to on Michael’s blog. So, without any further ado, here is our redress. Chabowka’s engines are looked after better than most of Poland’s steam engines. The steam centre carries out its own overhauls and boiler repairs, and Grazyna Sysiak, the General Manager, is justifiably proud of the standard of work achieved. Of course, the engines and rolling stock would be much better of under cover, but the lack of covered accommodation is a problem all over Poland, not just in Chabowka. In the meantime, the engines are protected as far as is possible with paint and thick grease. The ‘rusting’ exhibits are not Chabowka’s own, but are National Railway Museum engines, that have been recently towed to Chabowka from the infamous ‘skansen’ at Kreszowice. Until ownership or licensing issues are sorted out there is not much that Chabowka can do with them. UK heritage railway volunteers will pull a wry smile at Michael’s comment that their lines are “tourist goldmines”. Yes, the biggest UK heritage lines have a £ million annual turnover from ticket sales and the all important ancillaries, but they also have a £ million annual expenditure and, if it wasn’t for a massive input of volunteer labour and donations from the members of their support societies, very few of them would last long. To put things in perspective, there are something like 2 million railway enthusiasts in the UK and around a hundred thousand are members of railway societies. In Poland there are a few thousand railway enthusiasts and only 200 or so are actively involved with any heritage railway. Last of all, Michael jibes at having ‘to spend twice the price of adult museum admission to buy a film-and-photography ticket’ and decides to put his camera away while he visits the steam centre. I looked up Chabowka’s charges and compared them to those at Didcot, the nearest similar location to London. I have no doubt whatsoever that, even with the extra charges mentioned by Michael, the Chabowka Skansen offers excellent value for money. It does rather seem that Chabowka’s charging policy is aimed at making the steam centre as accessible as possible for Poles, while trying to get Western railway enthusiasts to pay a little bit more through the videoing and photography charges. Incidentally, although no charges at all are made during the Parowozjazda steam gala, I have over the last two years always left a donation of several hundred zloty in return for the excellent hospitality received at Chabowka by members of UK heritage railways that I have taken to the event. Dyspozytor received this e-mail from the Chabowka Skansen. The translation from Polish was done by ourselves. The railway museum at Chabowka is pleased to invite you to attend attend our fourth Steam Gala. This year it will take place on 6 and 7 September in Sucha Beskidzka and Chabowka. The procession of locomotives and the engine crew competitions will take place on 6 September at Sucha Beskidzka station. Each steam locomotive will pass through the station separately to make it easier for enthusiasts to take photographs. 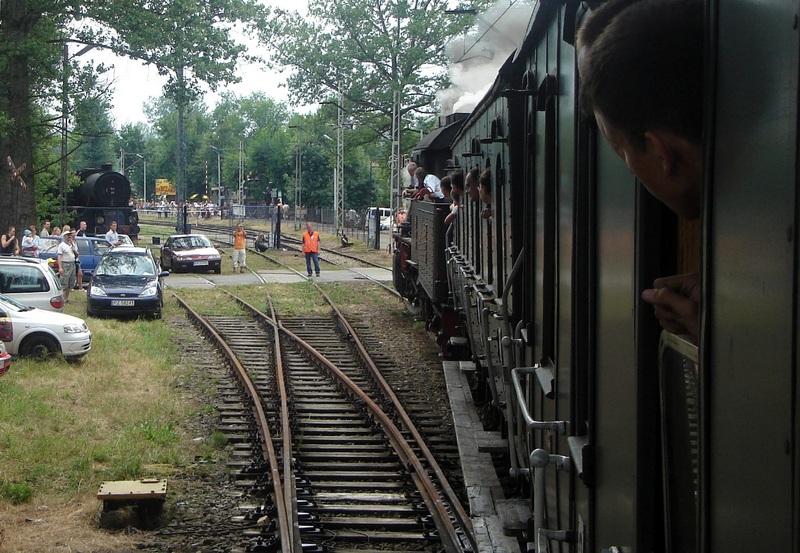 On the Sucha Beskidzka – Skawce section there will also be a procession of historic trains. These will include: passenger, goods and mixed goods/passenger. The trains will be hauled by steam locomotives: Ol12-7, Ty2-911, Ty2-953, TKt48-191, as well as three locomotives from Wolsztyn. Historic Polish railcar SN61-168 will be taking part, as will the only other operational member of the class SN161-183, which will be coming from Szczecin. Two steam locomotives and a vintage railcar will be coming from the Slowak Republic in order to take part in the festivities. This year an additional attraction will be the special vintage trains that will be running to bring visitors to the Gala from Cracow, Lachowice, Mszana Dolna and Zakopane to Sucha Beskidzka. There will be a charge for travelling on these trains. On Sunday there will be a demonstration of coaling and watering the steam locomotives. There will also be opportunities for cab rides throughout the day. Food and refreshments will be served throughout the day. The Komarna model railway club will be presenting their 1:120 (TT) scale model railway in one of the vintage coaches. As a result of many suggestions that we have received we will be running three special vintage trains, with photostops, on the non-electrified railway, line number 104 from Chabowka in the direction of Nowy Sacz. The three workings will be a passenger train, a goods train and mixed goods/passenger train. There will be additional ‘surprises’ on route which we believe will satisfy even the most demanding railway enthusiasts. There will be a charge for travelling on these trains. but will the skills follow the engines? In a development that BTWT anticipated a month ago, a reliable source told us that an understanding has now been reached between Juliusz Engelhardt, Undersecretary of State at the Ministry of Infrasructure and Chief Executive of Malopolska province, Marek Nawara, regarding the transfer of the Chabowka museum to Malopolska province. On hearing the news, Mrs Grazyna Sysiak, the General Manager of the museum, was speechless. Mrs Sysiak and her staff had lobbied hard to save the museum when it was slated for closure in 2003, and now they face an uncertain future. It’s a sad reflection of the management style of PKP Cargo that although the Cargo Board was aware that these discussions were taking place, no one thought fit to inform the people most concerned. The British-Polish Railway and Industrial Heritage Partnership – the ‘umbrella’ name for the Anglo-Poles who added their voices to Mrs Sysiak’s campaign in 2003 – will be making representations to the Malopolska Chief Executive’s office that Chabowka is not just a collection of historic locomotives and rolling stock, but a repository of essential technical skills that must also be preserved. Our favourite cleaning lady, who empties the waste paper bins at the Polish Ministry of Transport, tells us that Under Secretary of State for Rail, Juliusz Engelhard, and the Chief Executive of Malopolska province, Marek Nawara, will meet on Tuesday 17 June to discuss the future of the Chabowka Open Air Railway Museum. Apparently Mr Nawara is intending to create a company to take over the museum from PKP Cargo. Cynics are saying that the creation of a company rather than a ‘Foundation for Public Benefit’ (the Polish equivalent of an English Charity) bodes ill for the future of Chabowka’s collection of historic steam locomotives and rolling stock. Our foxy friend points out that perhaps it is no coincidence that the crisis at Wolsztyn and this development at Chabowka are both occurring at about the same time. About two years ago, PKP Cargo launched a special foundation, Fundacja Era Parowozow, to take over its historic collection of locomotives and rolling stock. The plan was a good idea. A foundation can apply for local authority grants and EU finding in a way that a commercial company cannot. There was also a lot of potential synergy between Chabowka and Wolsztyn. 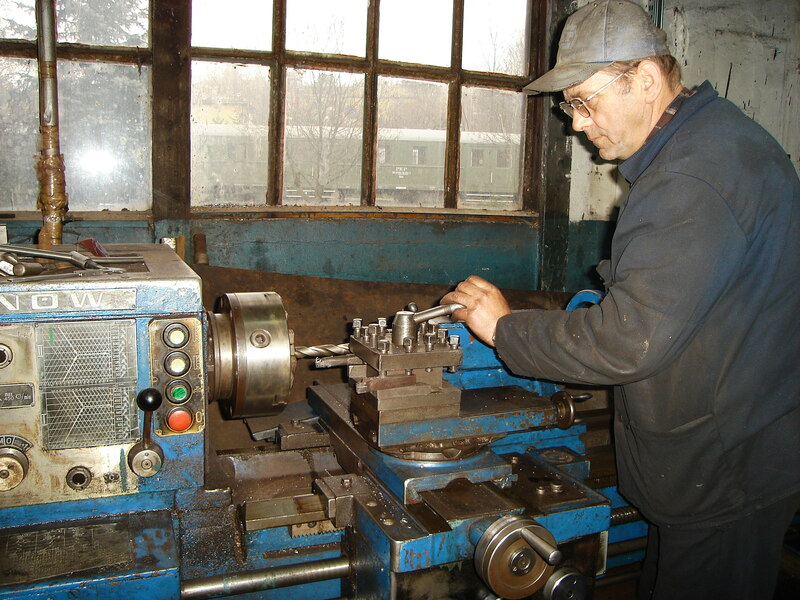 Chabowka employs 30 people, maintains its working engines in top notch order, has just passed out 15 new steam drivers, but its engines hardly do any work. Wolsztyn lacks good fitters and drivers, its engines are poorly maintained, but up to the 1 June was running scheduled steam services daily. However, it seems that some sort of deal was concluded in the corridors of power in Warsaw which stopped Fundacja Era Parowozow in its tracks. Instead of taking over custody of those items of Poland’s railway heritage which were set aside for preservation, the Foundation has been pushed aside to become no more than a marketing agent for PKP Cargo. A tour operator from Germany or the UK now has to first submit his requirements to FEP who then forward the request to PKP Cargo who then submit an (enormously inflated) estimate to FEP, who then send it on to the client. By the time the process is complete the prospective customer has gone elsewhere. Meanwhile FEP, which was set up to look after Poland’s railway heritage, now finds itself in opposition to any intentions that PKP may having to simply sell off Poland;s railway heritage to the highest bidder. Members of the Pyskowice-based Society for the Preservation of Railway Heritage and Organization of Railway Museums, Towarzystwo Ochrony Zabytkow Kolejnictwa i Organizacji Skansenow, have started work on the painting of Ty51-17 which arrived in March from the so-called ‘skansen‘ (open air museum) at Krzeszowice. Apart from having cab fittings and other moveable parts stolen or scrapped Ty51-17 had received no attention whatsoever during its 5 year sojurn at Krzeszowice. What a contrast to to the speedy start of cosmetic restoration work after its arrival at Pyskowice. Given the good work there being carried out by TOZK, it is hard to believe that the society have received no financial assistance from local government and that the future of Pyskowice Depot itself is far from secure. The remaining Krzeszowice engines have been taken Chabowka, Krakow Plaszow and Pyskowice, Regrettably, the rescue mission came too late for TKp 3407, TKp 5905 and Ty45-345 which were cut up for scrap at Krzeszowice. (Robert Dylewski) Click on photo for close up. The Polish government train came to the Warsaw today. You didn’t know that the Polish government had their own train? Well, not to worry, the government probably doesn’t know either. The last time it was used as intended was before General Jaruzelski declared martial law in 1981. During the martial law era, the government was too afraid of its own people to risk going around by train and since then the habit of using fast cars and planes has stuck. So the train has languished unloved and forgotten. One carriage has gone to PSMK’s railway museum in Skierniewice, another is in Chabowka, another has been ‘adopted’ by a retired railwayman. Occasionally, the odd coach or two is dusted down and used for some private special excursion. So what was the train doing in Warsaw? Was the Polish Minister of Transport entertaining his German opposite number prior to the sale of the profitable bits of the PKP empire to Deutsche Bahn? Are Mr and Mrs Peter Philips planning a quiet railway honeymoon in Poland? Is the President entertaining his mother in law? It hurts us to admit it, but we don’t know! There a bottle of Zubrowka for anyone who manages to find out and tell us before midnight (Polish time) today. At it’s best, Behind The Water Tower beings you the news before it happens, though we can’t promise do it every time. At the Chabowka Gala, Zbigniew Gondek, PKP Cargo Cracow Divisional Director of Operations announced that the Chabowka Steam Gala will take place during the 6 and 7 September. BTWT readers were tipped that the event would be moved to these dates on 15 April! 18 201, 03 1010, 52 8177, 03 2204 (Germany). !!! Any and all details may be changed by the organisers. Behind the Water Tower accepts no responsibility for the accuracy of this programme. 11:30 – 12:30 Wolsztyn Railway Station – competition for the title of “best locomotive crew”, organised by the Society of the Friends of Wolsztyn Steam Locomotive Depot. Conducted tours of the Depot by members of the Society. 18:20 departure of special train to Hungary hauled by MAV 109. 109. Chabowka Steam Gala – 6-7 September? Don’t book your Eurostar tickets yet, though you could start gently feeding the wife/girlfriend that maybe she’d like to take a Mediterranean break with her friends in early September. 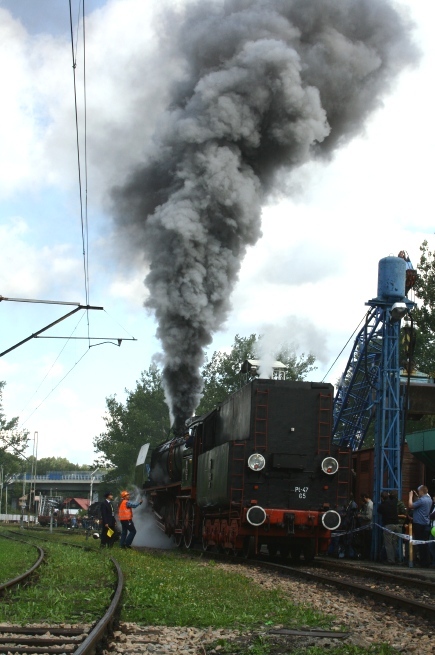 We’ve yet to hear officially, but we have received a strong tip that Parowozjazda, the Chabowka Steam Gala, will take place this year on the first weekend in September. Come to Chabowka! Yes, but when? 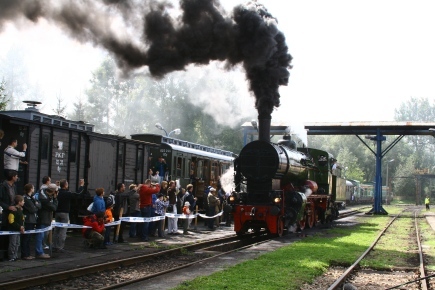 The Chabowka Steam Gala is the headline event of the Polish heritage rail calendar. Held traditionally on the last weekend in July, it involves not only all the steamable locomotives in Chabowka, but also visiting locomotives from Wolsztyn and abroad. 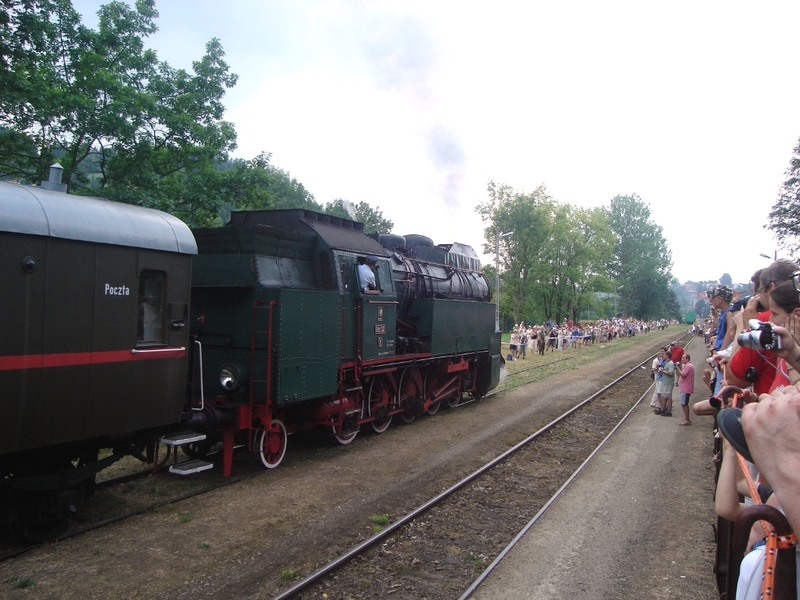 The parade is actually held at at Rabka Zdroj, a little way up the Nowy Sacz line, and involves not just steam locomotives, but vintage passenger and freight trains as well. My mate Neo, at the kolejelist discussion group, has organised two study trips for UK railway societies to visit Poland’s surviving narrow gauge railways and rail heritage sites, and I hear that his British visitors consider the Chabowka Steam Gala to be the highlight of their trip. So should you tell the wife that she’s taking the kids to Ibiza by herself, and that your company has sent you on a week long team building course at the end of July – and join Neo and his colleagues as they celebrate British-Polish friendship in various engine sheds all around Poland? Well, err… No. We don’t actually know when the Chabowka Gala will take place this year! It should be taking place on Saturday July 26. However, Wojciech Balczun, Chairman of the PKP Management Board, is entertaining some VIPs in September and has asked Zbigniew Gondek, his local Operations and Technical Support Director in Cracow, to consider moving the event to September. Our charming ‘cleaning lady’ friend, who empties the paper bins at PKP Cargo Warsaw HQ in Grojecka Street, has everything in hand and we will let you know just as soon as a definitive date emerges. Meanwhile, somebody please tell Neo! Kolejelist is a very informative Yahoo discussion group with news and views about Polish railways. A recent post confirms, what we have heard from various sources, that the Wolsztyn locmotives are not in good mechanical condition. Someone who is ‘in the loop’ recently told us that boiler water treatment is haphazard and that boiler washouts are not being performed as regularly as they should. The comment regarding Wolsztyn only having 5 steam crews deserves comment. Chabowka, who operate a limited series of steam specials, have recently passed out 15 new steam drivers! Here is part of the post. crews, three having [failed] their medicals recently. being not well paid and they have only three so far. [very] cold at this time of year! The Krosniewice Narrow Gauge Railway needs you! The campaign to save the Krosniewice Railway is gathering momentum. A number of letters have already been sent to the Mayor of Ozorkow, with a copy to the Minister of Infrastructure and pledges that more letters will be written are coming in as well. Can my letter make any difference? Well yes, on the basis of previous experience, we know that letters sent from abroad do carry a great deal of weight with the authorities. Sometimes even a single letter can make all the difference. Jaworzyna Slask (see above) – for storing steam engines. Elk, a fourth, was added later. Another steam museum was established at Karsnice at the private initiative of the manager of the workshops there. By 2000 the senior management of PKP had changed and the cold winds of commercialisation were blowing through the corridors of PKP. It was decided to get rid of all the steam museums with the exception of Wolsztyn and to concentrate the best locomotives there. An action committee was formed to save Chabowka. A group of experts from Krakow wrote a plan to develop tourism along the Chabowka – Nowy Sacz line, The National Foundation for Promoting Heritage Railway Trails was set up by Ryszarda Leszczynska. (see Papal Train) But all to no avail, by 2003 the Chabowka employees were given notice that the museum was going to close. It was at this stage that an Englishman called Mike Pease entered the scene. Pease, a director of the Spa Valley Railway and the Secretary of the New Europe Railway Heritage Trust (NERHT), was a descendant of Edward Pease, the banker of the Stockton and Darlington Railway. He had been following the Polish railway scene for some time and was the owner a Slask 0-8-0 shunting locomotive which he keeps at Pyskowice Steam Centre. He decided to write a letter of protest to the chairman of PKP, with a copy to the Minister of Transport. He also copied it for good measure to the chairman of the British-Polish Chamber of Commerce with the suggestion that the BPCC might like to organise a seminar on the tourism potential of Poland’s railway heritage. At this point Pease struck lucky because the Chamber duly obliged! A seminar, Polish Railway and Industrial Heritage as a Tourist Attraction, held under the auspices of the NERHT and sponsored by the Chamber took place in October 2003. The morning session was held in the British Consulate, the afternoon session in the Warsaw Railway Museum. Nearly every Polish heritage railway sent a delegation. PKP sent a team of three people. NERHT sent three experts from Britain. Not long afterwards, the decision to close Chabowka was rescinded. Today 8 Chabowka engines are in working order and very good mechanical condition. Occasional steam trains are run on the Nowy Sacz line and around Cracow. And what of the other railway museums? Wolsztyn is flourishing, although it’s reported that the mechanical condition of its locomotives is very poor. Nothing remains of Klocko. Jaworzyna was taken over by the local authority and then privatised. None of its engines are in working order. Elk is closed, but a great deal of rolling stock is still there and deteriorating fast. Recently two of its steam locomotives were transferred to the PSMK railway museum at Skierniewice. Koscierzna is run by PKP Cargo although none of its engines are in working order. The ‘forgotten’ museum at Karsnice lingers on in no man’s land, trapped by the reluctance of the PKP Estate Department to pass the custody of the engines over to the council of Zdunska Wola.